Helen and I went to the Natural Gardener this weekend! I love, love that place. I was hoping to pick up some artichoke plants, but they had already sold out. Instead I picked up a packet of kabocha squash (Japanese pumpkin) seeds and a couple of hatch chile plants. We’ll be back in a week or two to buy tomatoes/basil/etc. 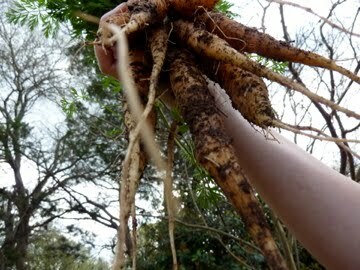 Anyway, to make room for the pumpkins I had to unearth my row of carrots that had been in the ground since October (!). Helen and I also realized that many of my radishes, which had just been planted a few weeks ago, were ready to come up too (their pretty little tops had poked through the soil). And hey! we could also eat the broccoli leaves like Joanna, and the stalk too! And we could top it off with a salad with my homegrown lettuces! This was all very exciting. 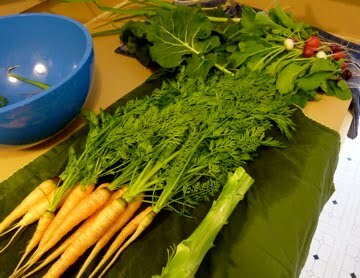 A list of harvested items: easter egg radishes, carrots, broccoli stalk and leaves, lettuces, parsley, green onions, green garlic. 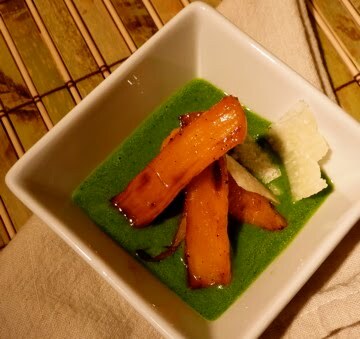 For this dish, I made the carrot top puree Kevin made on Top Chef last season (minus the tarragon + green garlic). For the carrots, I cut them into equal-sized pieces and put them into a cast iron skillet where I had melted/combined a tablespoon of butter, a tablespoon of honey, a tablespoon of lemon juice, and a bit of fresh thyme. 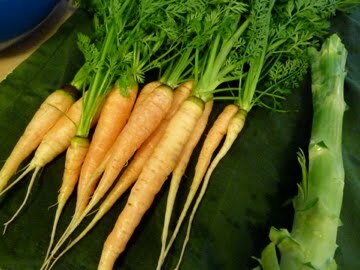 This went into a 375 degree oven for about 15 minutes, until the carrots were caramelized. Served with the carrot top puree and a thick shaving of parmigiano, this was Andy’s and my favorite. 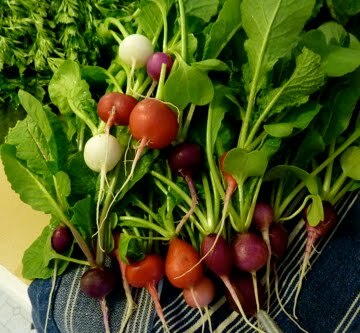 If you (like me) planted 4000 radishes in your yard, you must, must try this recipe. 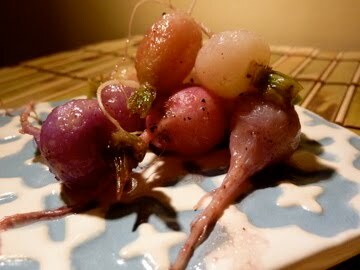 Radishes are great cooked! More mellow, tender, and mildly peppery. This was Helen’s favorite. This recipe comes from the cookbook All About Braising. Trim the radishes of their roots and trim the green tops, leaving about 1/4 inch (we added some of the peppery tops to our salad greens). Place the radishes in a medium skillet that will hold them in a single layer. Add the butter, stock, sugar, and salt and pepper to taste. Bring to a simmer over medium heat, cover, reduce the heat, and braise at a low simmer until the radishes are easily pierced with a metal skewer, 20-25 minutes. Remove the lid, shake the pan to roll the radishes around, and continue simmering until the liquid reduces to a glaze and coats the radishes, another 5 minutes or so. Serve warm. This was based off a kale recipe I found on Food52 by talented cook ‘Loves Food Loves to Eat’. We thought this was delicious! If you don’t have access to broccoli leaves, try this recipe with kale. Sauté shallot and sliced broccoli stalk in olive oil in a large pan over medium heat. When the shallots are golden and the stalk slices are becoming tender, add a pinch of salt, a pinch of red pepper flakes, lemon juice, and broth. Slowly add chopped leaves. Allow the leaves to wilt and soften, and continue cooking until most of the cooking liquid has evaporated. Serve hot. 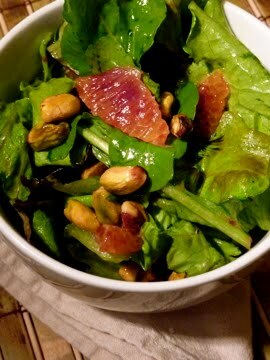 I was just going to serve lettuce dressed simply in my go-to lemon/dijon mustard vinaigrette, but then Helen recommended adding the cara cara orange in my fruit bowl and the pistachios in my pantry. It was delicious! I added a bit of the orange juice to the vinaigrette, and it was a perfectly lovely salad. This was such a fun dinner! I love that living-off-the-land feeling, like the one you get when you read the first Boxcar Children book (i.e. they use the stream in the woods as a method of refrigeration and cook the eggs they find in a bird’s nest). I want that. wow! beautiful veggies. this is a very classy meal. we love eating meals from the yard too. consider the towel a gift. Went looking for ways to cook my broccoli leaves since they a loaded with vit.A&C and your lemony braised broccoli leaves and stalks look ed delicious. hope it's really tender, I wasn't going to cook the ceter rib. Maybe peeling the rib is the secret. I knew people were eating broccoli leaves but needed some recipes. 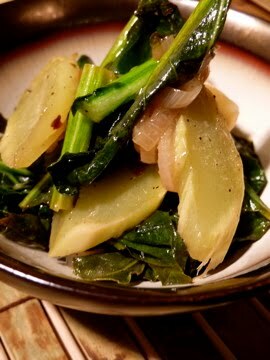 The Lemony Braised Broccoli Leaves & stalk were the ticket! I'm getting ready to pull my spring broccoli crop, since it is finished, but hated the idea of tossing all that beautiful green material into the compost bin. Tasty!